Here are just three of the new we brought home from market... many more on Tanya's inside page, so scroll down to see the others, too! A Perfect World - The colors and balance in this piece is just stunning. The verse is charming... but if it's not your favorite... change it! DO NOT pass by this pretty piece! Measuring only 10 x 9 on 40ct over two, it'll be a little larger if you go with 32ct. Coded for hand-dyed flosses of Hazelnut, Havana, Beige, Grasshopper, Red Rocks, Dark Chocolate, Boysenberry, Battleship, Juniper, Green With Envy, and Whitewash. You'll also need two skeins of DMC 310. Tanya's 4 dogs are pictured on the back of the chart - I think they were her inspiration! 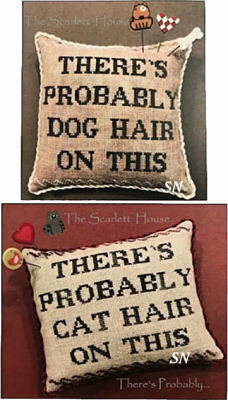 There's Probably Dog (Cat) Hair On This - Ok, I guess there's no doubt of the inspiration for this set of cushions! Choose just about any fabric you like, in any count, and even change up floss colors if you want! Each finishes approx 4 x 5 on 32ct. Just Another Button Company made a cute pin trio for each of these... the dog's version has a brown dog, checkerboard heart and a little bone, while the cat version has a gray kitty, another heart and a little bird. Pins available separately from the chart. 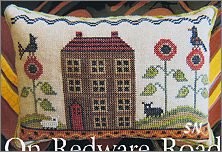 On Coverlet Court - This is sort of a companion (in name anyway) to On Stoneware Street and On Redware Road. 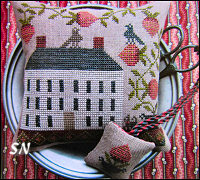 Just a pretty pin cushion design -- about 3-1/2 x 5 on 36ct. 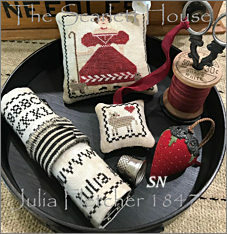 Julia Fletcher 1847 - This is a sweet set of pieces... the pincushion is stitched over one thread (on 40ct, but you can do whatever you like best), and finishes just 3 x 3. Next is the bitty fob - stitched over two it is only a little over one inch in size. Finally is the needle roll - it finishes approx 4 x 10 with that alphabet on the backside, with wool lining on the inside. The stripe you see on the roll is the finishing ribbon to tie it closed, and I think that red berry is an antique. (But you can make one out of Week's wool - the same color you line your roll with!) Chart. Berry Merry Christmas - Oh, we have 9 months to finish this before Christmas! A sweet 3-1/2 x 6 greeting sign... stitched with Mossy, Wild Berries, English Ivy, Jakey Brown and snowball hand-dyed flosses! 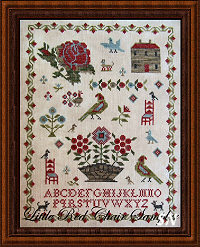 Black Dog Sampler - This is a neat little piece - it doesn't have all the alphabet letters in it! Finishing 7 x 10 on 40ct, it uses Gloriana silks or DMC flosses... maybe you'll choose hand-dyed cottons from your stash. 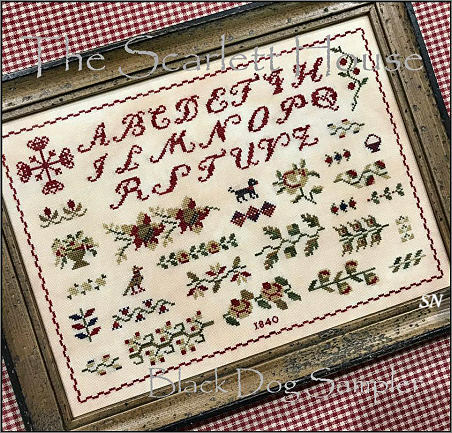 All the motifs are scattered on here in such an organized fashion... but of course that little black dog - the plainest of them all - gets your sampler named after him! Tanya Brockmeyer has a new pin cushion design... this sends us right into Fall and Thanksgiving Season!!! 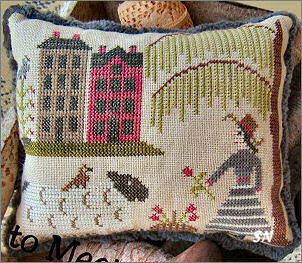 Finishing just 3 x 5-1/2 on 36ct Dirty Edinburgh Linen, and stitched with Gentle Art Sampler Threads, it is trimmed with Lady Dot's Jack-colored hand-dyed chenille trim. Makes me want to go downstairs and bake something that smells good!!!! 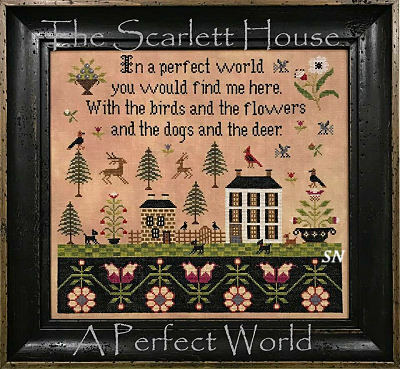 The Scarlett House has 4 new releases -- all charts -- finishing varies from pin cushions to framing and that little bag treatment. 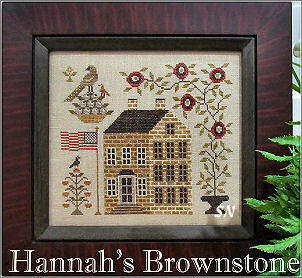 Hannah's Brownstone -- 125 x 107, this finishes approx 6 x 7 on 36ct linen; it uses 12 shades of Weeks or DMC. It's very pretty, everyone seems to like the contrast of the all the tiny rectangles in the windows against the rounds of the flowers and the waves of the stems. 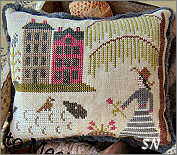 Spring Fling Stitching Bag -- Stitching on this measures 100 x 73 so it finishes about 4 x 6 on 35ct. The sewing bag is a simple pouch finishing treatment, so pin-cushion finishing will also work as an alternative use for this design. 8 Colors of Weeks hand-dyeds; it's a pretty little piece, and it will be charming no matter your end use! Nice to Meet You -- Measuring 91 x 74, this one finished approx 4 x 5 on 36ct... again, Weeks hand-dyed or DMC solid flosses. The picture kind of cuts off the bottom of the design -- there is a basket down there as well as her legs and boots and those of the sheep! More geometrics -- the repeating lines of the tree branches and her skirt vs the tiny repeating squares of the houses... the colors are pretty; it's just a fun little piece. 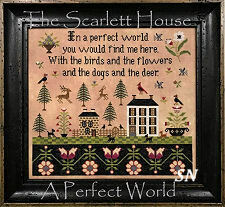 The Scarlett House has 7 new releases... I thought these two were charming to show on Just Arrived... all the rest are tucked below. Presented as charts, both of these patterns feature multiple small pieces to finish and tuck into a box of some sort. 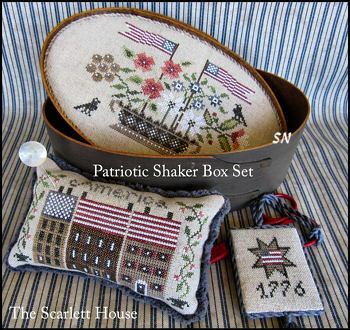 Patriotic Shaker has a pretty pin cushion, topper and fob... you CAN finish the flag basket as the cushion and row houses as the box topper -- depends on your box! I like the stars and stripes roofs on them! Weeks and Gentle Art's hand-dyed flosses, with Lady Dot trims. School Days features two different fabrics -- makes it a really cute set! The schoolhouse threadkeep board and fob are worked on 28ct Gingham, the chalkboard on 28 black (but it's over ONE thread -- so be aware!). 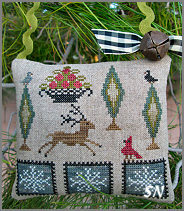 That little fob is kind of a 'mattress' shape and is trimmed with Lady Dot's miniature Birds Nest Rik Rak. As for the cool lunch box... go to Goodwill and find something. Hit it on a few things to bang it up just a little...sand it some, leave it out in your yard -- preferably a muddy corner or under a bush somewhere -- let it see some weather, and VOILA! You will have aged it perfectly! Companions On Redware Road! Just a sweet little house, this finishes approx 3-1/2 x 5 on 36ct. Uses just 310 and Classic Colorworks of Blacksmith Blue, Stepping Stones, Cherry Cobbler and Weeping Willow, and features Lady Dot's Mossy chenille trim. A sweet little piece, this finishes approx 4 x 11 on Picture This Plus's 40ct Ale. Coded for hand-dyeds or DMC, it'd make a pretty little decorative pillow. Very traditional and organized alphabets in crosses and eyelets, this finishes approx 8 x 9 on 36ct. 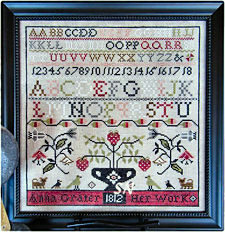 Gentle Art Sampler Threads of Woodrose, Endive, Pecan Pie, Oatmeal, country Redwood, Tin Bucket and Black Licorice. Anna Grater is Tanya's maternal grandmother's name... alive long after 1812... but the photo on the front of the chart IS her grandma! Just a little artistic license with the chart! 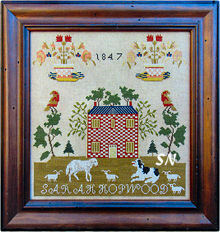 An 1847 piece, Tanya worked this on 46ct linen... maybe you'll want something larger... it's YOUR stitching, so you decide! Coded for silks or DMC, you can get out your hand-dyed cottons and see where you want to add some -- they take the flatness out of the trees, bricks and grassy area. Also, you CAN leave off the Sara name at the bottom all together, or sub your own! 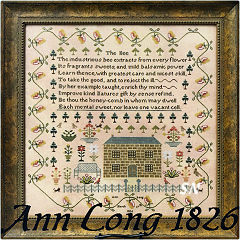 Measures 187 x 183 in stitch count. This is a pretty piece! 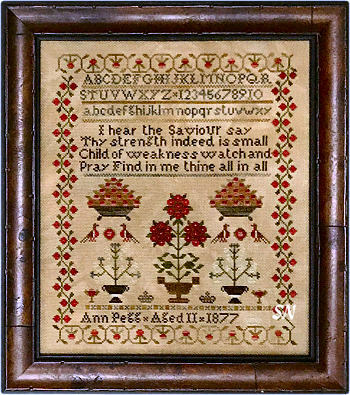 Neat border, pretty floral basket motifs, the verse tells you to work as hard as bees do to reject the ill and take the good. 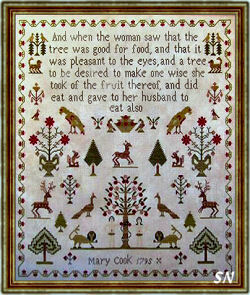 It's a cool verse and there is a lot going on in here... it'll make a commanding sampler on your wall. Measures 297 x 327 -- so 16-1/2 x 18 on 36ct -- quite good sized. Coded for 4 brands of silks or DMC. 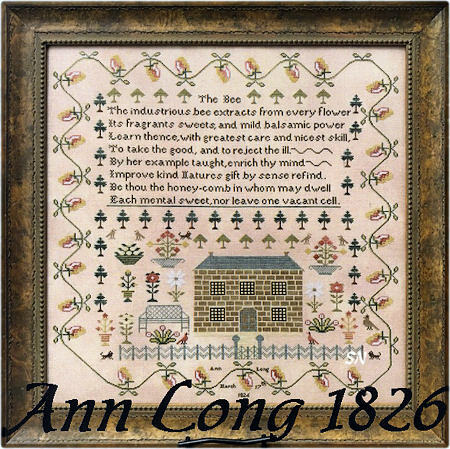 This sampler is in Tanya's personal collection -- she shares Ann's Birthday... only Ann is 130 years older!!! 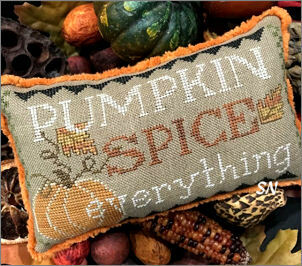 Tanya has 4 new designs -- all presented in chart format -- that look like Autumn and Halloween are finally around the corner!!! Everything is charted for hand-dyeds or DMC. 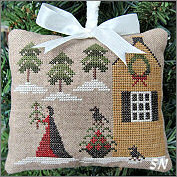 Salem Hill Sampler -- Be brave, choose any count of black fabric you can see to stitch on to make this cute evening Autumn scene. On 40 over two it finishes 4-1/2 x 4... on 14 it finishes approx 6 x 6. The dormant grass in the lawn is Sage -- doesn't it look dismal and kind of spooky??? Lady Dot's Mossy Chenille trim surrounds the finished cushion. 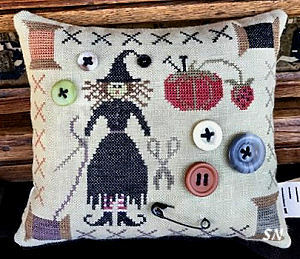 Sew Witchy -- This is so cute! Add your own buttons as shown, or actually stitch them instead -- they are charted there just in case. 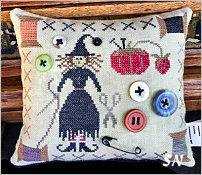 A fun cushion for any stitcher, most neutral fabrics will do for this one, but you might want to get that measuring tape ribbon Tanya shows in the model pic on her cover -- cute trim, and available at Hobby Lobby! Finishes approx4-1/2 x 5 on 36ct. 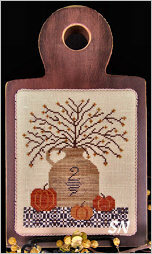 Fall Frolic -- A busy Halloween scene complete with graveyard, owls and the moon... this is stitched on Lakeside's Cedar Plank linen with hand-dyed cottons. It finishes approx 6 x 3-1/2 on 40ct, (you can work on any count you like) and is shown against black rik rak mounted on Week's Cognac Wool. (We have 4 finishes of that -- all look great -- solid, houndstooth, herringbone and glen plaid.) I love the jaggedy border which looks uneven and herky-jerky... but is actually very even and planned! Would make a cute brick-shaped block stand-up or door stop! Bonnie's Bittersweet -- A pickle crock full of spindly Autumn Bittersweet, Tanya has mounted it on a *butter board* that you can purchase on Etsy. 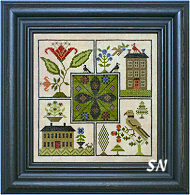 Pretty coverlet design on here as well, this finishes approx 4 x 5 on 40ct. Scarlett House has released a charming 3-1/2 x 5-ish design that can be finished into a 'tray-setting' or a pin cushion. Stitched over 2 on 40ct is is worked with just 5 shades of hand-dyeds -- Cast Iron Skillet, Caper, Oscar, Sage and Country Redwood. 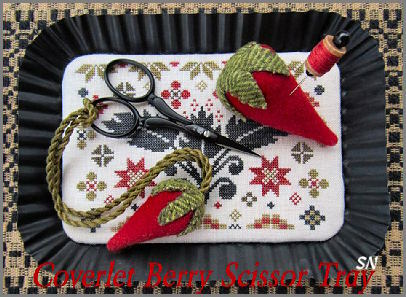 The tray you see in the pic was used for the model -- the chart includes details for preparing that separately purchased (from Hobby Lobby) little tray... but recommends a pin cushion treatment as well. 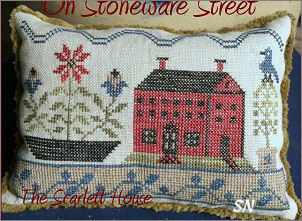 The Scarlett House has beautiful new things! Pin cushions and an awesome new line of handmade and painted Shaker boxes, Tanya has done a great job! 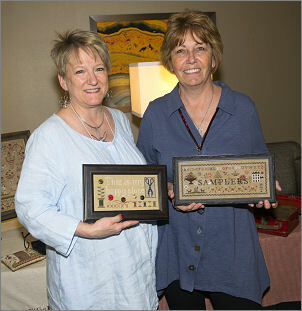 Samplers -- Kind of an 'advertising sign' for a stitcher! 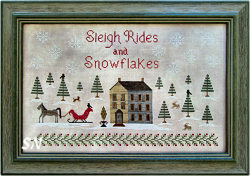 Stitched on 40ct (you can choose anything you want), this finishes approx 11 x 4. 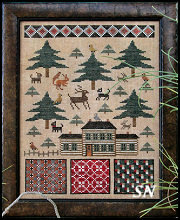 Just spot motifs and pretty colors, it'd be fun on your sewing room door!!! American Homestead Sewing Set is a multi-piece design including a cushion, scissor holder and fob, a mini hornbook. 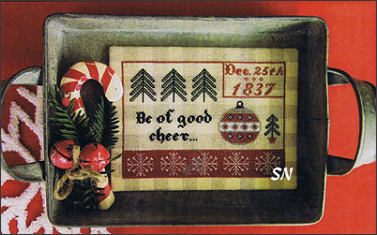 It is shown tucked into a Shaker tray - brick red on the outside and black in the inside. 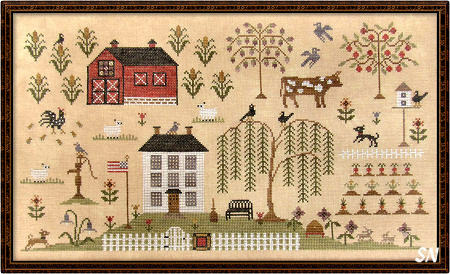 (our shipment is on the way) The farmyard scene is the focal point on that darling cushion! Red Shaker Tray and Hornbook We have a beautifully handmade Shaker-style wooden tray with matching mini-hornbook by master-woods-craftsman Robert LeHay. Measuring approx 7 x 9-1/2 x 1-1/2, it is completely hand-made and exquisitely finished. Brick Red on the outside, black on the inside, there is a 4-x 6-ish black hornbook paddle that goes with it. 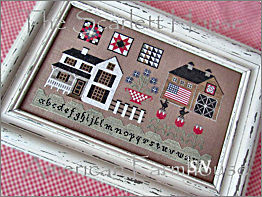 Scarlet House has featured this set on her new American Homestead Sewing Set chart, and both are stunning!!! Tanya's designs are charming, and wow, they look great stashed into this awesome little tray! Attach a small cushion to the hornbook, and nestle everything else in the beautiful tray! Note! 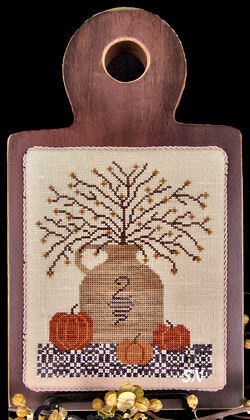 The Tray & Hornbook set are backordered, and we expect maybe September delivery. 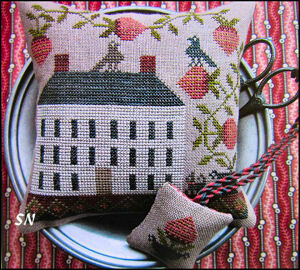 What a cute bitty set of fob and matching cushion! I love the colors of Gentle Art flosses -- Grasshopper, Country Redwood, Soot, Old Hickory, Chalk, Piney Woods and Black Licorice, the cushion measures 95 x 71, while the baby fob is just 29 x 36! Garnished with 4 black buttons... this is so simple, but so striking! Offered as the chart. 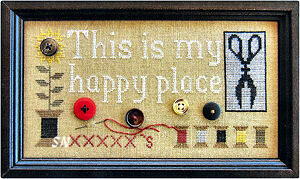 THIS needs to hang above your stitching chair, or as a sign into your Stash Room!!!!! How cute! 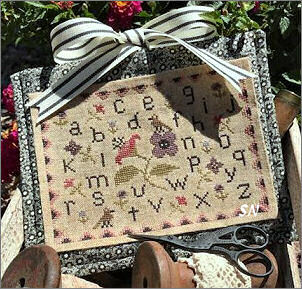 Presented as a chart, you can add the button embellishments and even that actual needle and thread on there! Choose any fabric you like, but the model is worked on 40ct, and finishes approx 7-1/2 x 3-1/2. Don't know what is the specific charm to this little sampler, but whenever we take it to a show -- it ALWAYS sells out! Stitched on 36ct it measures 7-1/2 x 10, and is worked with Weeks flosses of Bullfrog, Cayenne, Flatfish, Jay Bird, Terrapin and Kohl. Pretty motifs scattered here and there, everyone likes those little red chairs!!!! 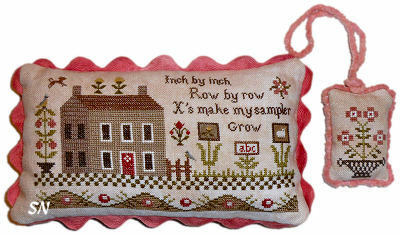 Another very popular little sampler, this one finishes about 6 x 7 over ONE on 28ct... or 9-1/2 x 11 over two on 36ct. Forest Glade, Country Redwood, Copper, Dark Chocolate, Tin Bucket, Apple Cider, Old Hickory, Roasted Marshmallow, Picnic Basket and Garden Gate... organized and simple, but it's charming! Another of Tanya's pretty pin cushion designs, this one features lovely shades of green accented with some teal. It's really simple, but her colors are so pretty -- the Country Redwood color POPS against everything else. Finishing just 4 x 4-ish, along with the Redwood, use Oatmeal, Black Licorice, Chamomile, Tin Bucket, Picnic Basket, Deep Forest and Piney Woods. Choose a luscious chenille trim to edge this! Very organized and repetitive, it features old colors of brick red, mossy green and black. 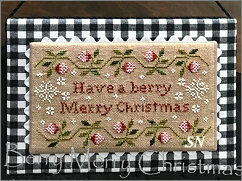 This is a fun design that needs to grace the top of a scrap-box of yours! Offered as a chart and stitched on 40ct with silks or DMC flosses... it is shown on the top of one of those brown paper mache' boxes that has been painted and waxed. 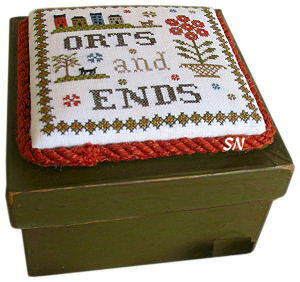 Line it with a cut of pretty wool, and you have a really cool little Ort and End catcher! This would be pretty as the front of a fabric envelope as well... something you could open and tuck the errant scraps into. Save them up all year long, and stuff a clear glass Christmas Ornament full of your Orts for 2012! You can take the girl out of the country, but you can't take the country out of the girl! 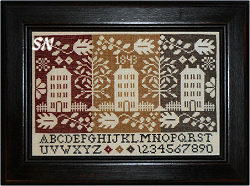 This 256 x 143 stitch count sampler finishes approx 16 x 9 on 32ct... and is stitched with Gentle Art Sampler Threads. 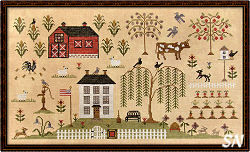 Tanya says this piece features several of her childhood memories of growing up in The Heartland of America. The corn, the cool barn, check out the cute chicken, too. The willow tree is neat, the house is organized and so is the garden... everything in here has it's place and purpose on the family farm. A pretty piece, you could personalize it with the family name and a *date established* especially if it was a long time ago! 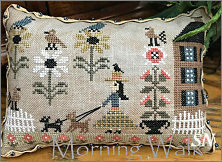 Chart format -- choose virtually any fabric you want to stitch on -- just something that will allow the light 'Picket Fence' color of floss in the house an fence to show up. 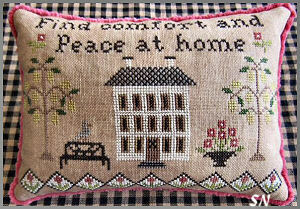 Find Comfort -- 'and peace at home.' Well, that's pretty basic and good advice! 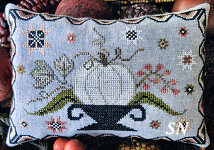 Stitch count is 109 x 81 -- so generous on 36ct at 6 x 4-1/2. 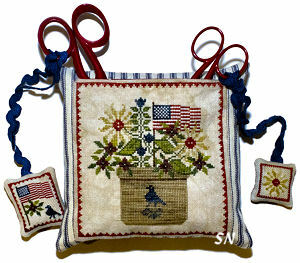 Patriotic Scissor Pocket -- Inspired by antique pottery stoneware crocks, this sports a grand bouquet of summer splendor! The wavy flag in there, the charming sawtooth border -- both are accented with RED scissors (of which we have several offerings!) Main design is 98 stitches square -- approx 6 x 6, and the fobs are coordinating smaller bits of the larger design. 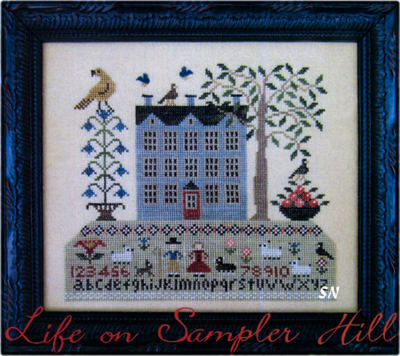 Center Point Sampler -- Wow, this is gorgeous in person! 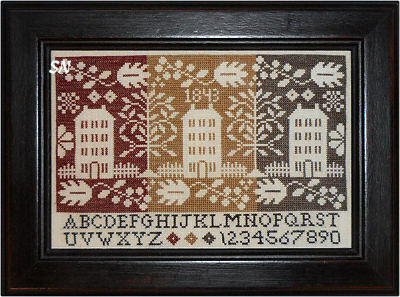 On 32ct, it finishes approx 7-1/2 inches square, and is coded for silk or DMC floss. The colors are bold, and I LOVE something about the organized picture this presents. I don't know if it's the border lines, the squares and their interruptions or simply the gorgeous solid, exciting motif in the center -- those greens are so yummy! 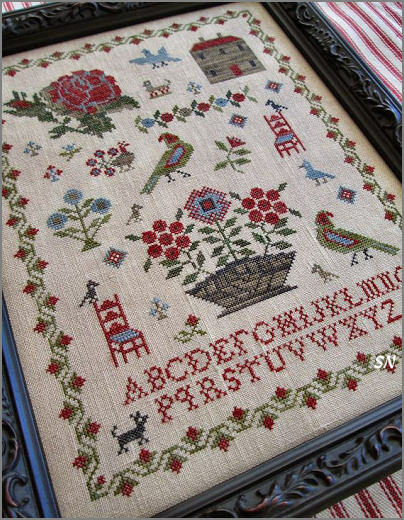 I think you could even split this apart -- stitching each main square with its particular part of the middle, along with the middle panel, and make a basket of 5 pin cushions to nestle together -- as 'bowl fillers' in your bowl! 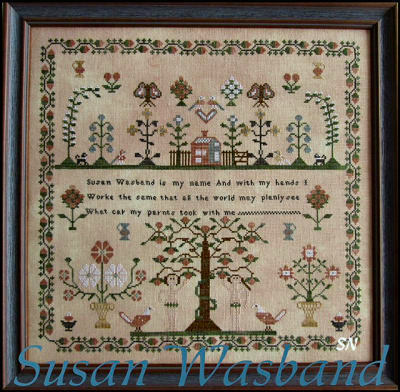 Inspired by Pennsylvania Dutch woven coverlets, this calls for only three Gentle Art Sampler Threads -- Country Redwood, Harvest Basket and Wrought Iron. You'll want a piece of wool for the back of this -- (design is only 6 x 8 on 35ct) so you might want to find something pretty first and then match your threads. Calming little piece! A traditional Adam & Eve piece -- this finishes approx 14 x 15 on 40ct. Coded for Classic Colorworks Belle Soie Silks, very symetric and organized, Tanya owns the original sampler in her personal collection! 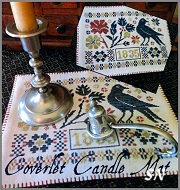 Super cute finishing for this simple piece that finishes a mere 3-1/2 x 5. Offered as a chart... you may want to change the date of 1837 on there to something else that has significance to you. ...on the vine... how'd you get so very fine? This is shown stitched over one thread for a cool pin cushion finishing treatment. 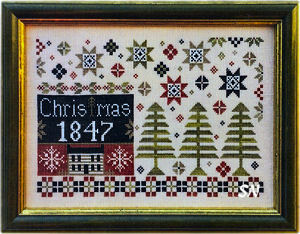 The stitch count is actually pretty good sized -- 152 x 86, so if you choose over two on 28ct, it'll be a generous 11 x 6-1/2! Offered as a chart, choose a neutral fabric and grab Week's flosses of Fawn, Putty, Chickpea, Cocoa, Swiss Chocolate, Flatfish, Bark, Onyx and Cognac. Then, trim with a bit of chenille trim -- we have several really good color options!!! 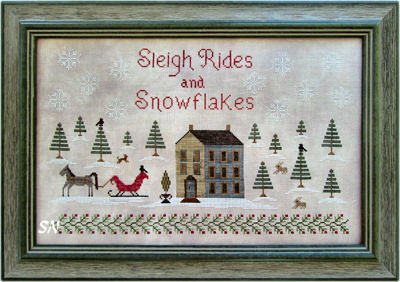 A pair of new designs by The Scarlet House, both are offered as small charts. 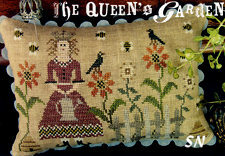 The Queen's Garden is cute... the model is presented on 40ct (again, choose ANY fabric you like best -- YOU are the one stitching and enjoying it!) Putty from Weeks Dye Works is the yummy background color, and the pattern uses a mixture of over-dyed flosses, (which we always like better than the regular DMCs.) Perfect Pie Crust, Forest Glade, Seagull, Oatmeal, Black Licorice, Gingersnap, Mustard Seed, Old Hickory, Roasted Marshmallow, Picnic Basket, Weathered Barn, Garden Gate and Cucumber are the choices. It finishes approx 6 x 3-1/2 on the 40 ct, and the model shows rik-rak trim all around. Life on Sampler Hill measures 120 x 108 in stitch count so will finish approx 7 x 7-1/2 on 32ct. You can choose ANY count fabric you wish... this is coded for both DMC and Classic Colorworks hand-dyed flosses. I love that big blue house, the repeating patterns of the leaves and that solid green yard... so the hand-dyed flosses will really be showcased in this design-- choose those! It uses Blackbird, River Rocks, Sunkissed, Caterpillar, Blacksmith Blue, Stepping Stones, Antique Lace, Joshua Tree, Ladybug, Cherry Cobbler, Hazelnut, English Ivy, and Whatley Woodlands. 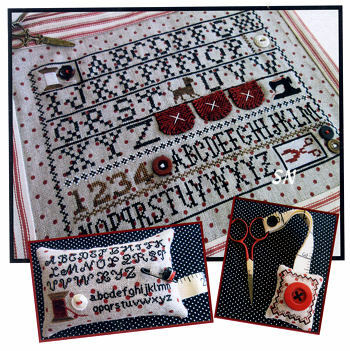 We have a pair of new charts by Tanya Brockmeyer that are pin cushions with coordinating smaller scissor fob designs. The charts are beautifully presented and the front covers are LOVELY! She does PERFECT photography for you... you could probably stitch off the cover pics! 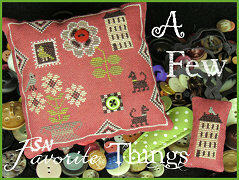 A Few Favorite Things has the most interesting color palette -- It is so different, but I absolutely LOVE it! I don't know if it's the punch of the acid green against the soft red-pear, or the golden inside of that pear -- I want to cut up green apples and ripe pears and sit down right now and eat them! Stitched on 40ct Aztec Red by Weeks, the main cushion finishes approx 4 inches in size. 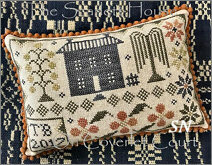 Strawberry House is much softer -- all Gentle Art Sampler Threads in dusty grays and raspberries. Again 4 x 4-ish, we're into *bowl-fillers* these days... (a ridiculous new buzz-word on HGTV!) A Soft Tin-Roof-color with a chalk-y house... the berries are growing in the wild garden. *Inch by inch, row by row, X's make my sampler grow* Scarlet House has a charming pin cushion design that features a tiny companion 'fob' for the cushion. 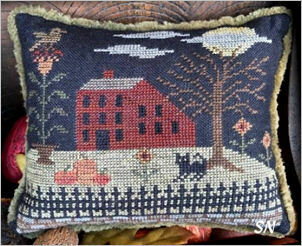 It's shown on scissors, but I think it'd be cute attached to the cushion itself. Generous in size, it measures 119 x 64, so finishes approx 3-1/2 x 6-1/2 on 36ct. 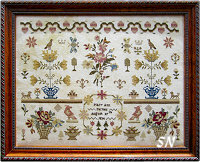 Charted for Needlepoint Silk, it's an easy one to convert to cotton hand-dyeds if you'd rather use them. Offered as a chart... isn't the pink rik-rak finishing striking on there? Scarlet House has several other new releases... scroll down to see them! Oh, I like this one! That beautiful repeating positive/negative color scheme... I don't know which way I like it better! Wouldn't it be neat to stitch BOTH ways, and finish your pillow with BOTH pieces of needlework? 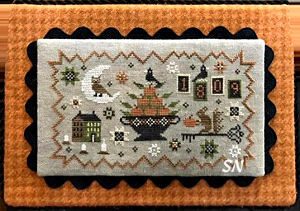 Calling for only DMC 3857, 3021, 420 and 310, the stitch count is 145 x 80 -- making this finish approx 5-1/2 x 8 on 36ct. Very simple, but very striking! Offered as the chart. There was no date added... so pick one yourself, and change the name to YOU! This is a pretty piece -- measuring approx 15-1/2 square if you choose 28ct to work it. Smaller linen will make it smaller in size. 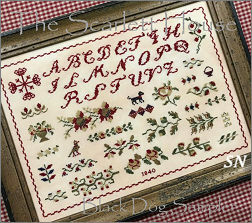 it would be a good beginning sampler to work -- the border is regular!!!!! Offered as a chart. Mmm... lush evergreens, a log cabin (even though it looks pretty big and sprawling!) and the wool coverlets... this needs to be stitched for a log cabin! 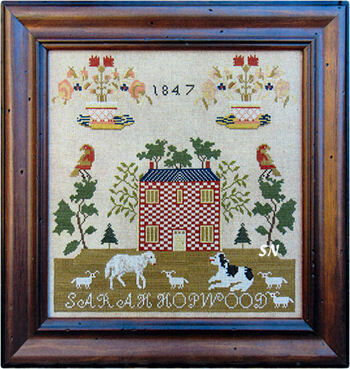 Offered as a chart, this is worked on Week's 36ct (we have 30ct as well) Straw Linen with hand-dyeds. 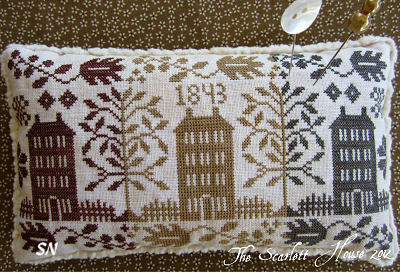 Picture those coverlets stitched as individual pin cushions!!!!!! Just a pretty piece, it finishes 6 x 8-ish. 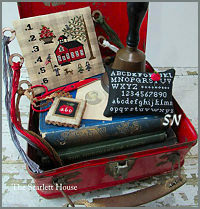 Scarlet House has a pair of new designs that are very pretty and appropriate to the Fall Season. Two small designs to make into walnut-shell-stuffed cushions to pack into that ever-growing basket of stitched cushions! Tuck several different projects into one basket, and leave it on an end table or counter... something fun people will dig through to see them all! 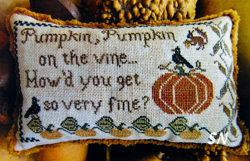 Penny Pumpkin is worked on a medium-toned linen -- something to let the Sampler Thread Oatmeal color of the main pumpkin stand out. Stitch count is 112 x 87, so it'll finish approx 5 x 7 on 32ct. 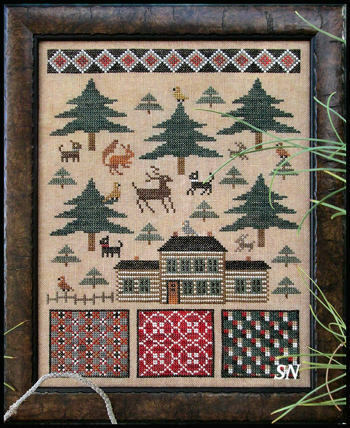 The border is reminiscent of a woo; penny rug, and it'd be pretty done with bits of colored wools instead of the stitching -- if you're creative! 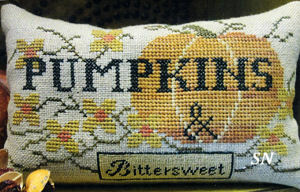 Pumpkins & Bittersweet is a little smaller -- 3 x 5-1/2, and is also worked with Gentle Art Sampler Threads. She has it charted so that you can stitch 'bittersweet' over one OR two threads. This is a charming project bag, fob and pin cushion set Stitched with only 4 colors of Sampler Threads on the new 32ct Natural Belfast linen that has red polka dots printed on it...it's just the cutest thing! Black Licorice (2 skeins), Picnic Basket, Buckeye Scarlet and Chalk... it features Weeks Dye Works Candy Apple (any of the 4 patterns in our Schnigglet-cut size will do nicely) hand-dyed wool for the penny rug 'tongues' ... one pic has them buttoned down with black buttons, the other shows white X's. The thread spools are 'wrapped'with Satin Stitches... everything is so crisp and cute! The tiny fob finishes approx 2-1/2 x 1-1/2 -- it is over one. The pin cushion measures 64 x 110 stitches -- but it is over one as well - so finishes approx 2 x 3-1/2. 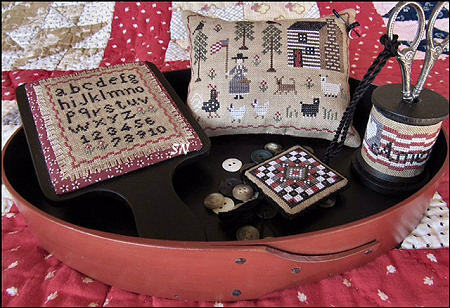 The main sewing case features Eyelet stitches in the alphabet, and those fun wool pennies, with the motifs worked over one thread again. It's stitch count is 105 x 145 -- so it finishes about 7 x 9. I love the colors, I love the polka dots, and I love the wool touches! Get out some red scissors, too! Hey, this is kind of a cute thing! Stitch a glaring cat face to tuck beside some of your other Halloween decorations, or make a small ornament/fob -- the stitch count on this is only 62 x 66. Stitch the eyes, or make them from buttons, you'll need your favorite fabric plus Sampler Threads of Oatmeal, Gold Leaf, Raven and Tomato. 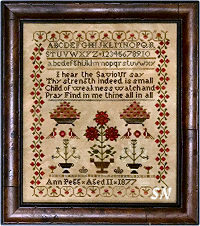 Offered as a chart... the tiny fob you see on there is a mere 30 x 30 stitches -- kind of a little bonus. Here's a chilly scene, cold and quiet! Stitch the entire thing, or leave off the words -- there are big snowflakes in the background (sort of hard to see in our image, but they're there!) that you can re-arrange in behind the evergreens. 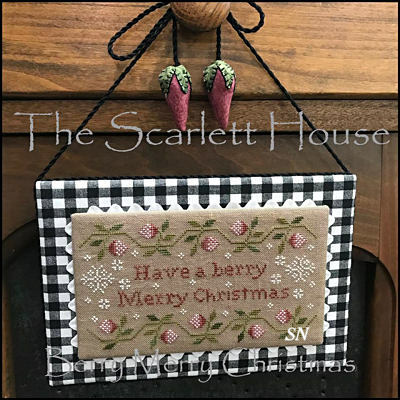 Scarlet House presents this design in chart format that is worked on a dusky hand-dyed -- lots of good colors come to mind (like Week's Tin Roof). 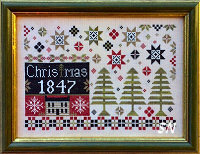 The stitch count is 220 x 138, and colors listed are either Sampler Threads or DMC. Dried Thyme, Forest Glade, Country Redwood, Wood Smoke, Tin Bucket, Chalk, Picnic Basket, Wood Trail, Deep Forest and Espresso Bean... you can just feel the deep, quiet colors. The dogs and bunnies are worked over one thread -- everything else is over 2.